Welcome to the Religious Education Association, an Association of Professors, Practitioners, and Researchers in Religious Education. We meet and work together to advance substantive research, probing scholarship and practical approaches to religious education, particularly through our journal Religious Education and our scholarly monograph series Horizons in Religious Education. The deadline for responding to the CFP for our upcoming November meeting in Toronto is May 1st. One way to help publicize the meeting is to share our most recent eREACH, which has details about the various plenaries. We have also made flyers available that you can download and print to post. 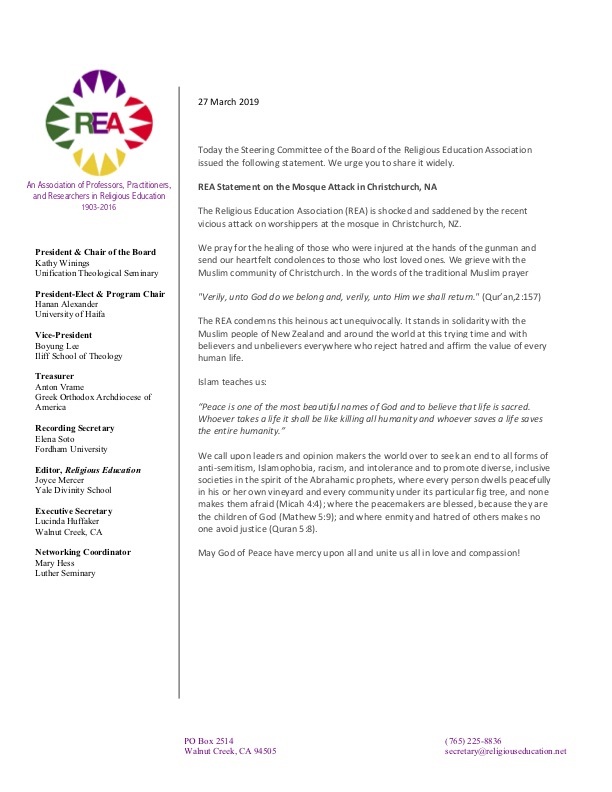 Today the Steering Committee of the Board of the Religious Education Association issued a statement on the mosque attack in Christchurch, NZ. We urge you to share it widely. The electronic submission process for REA2019 is now open! Please make sure to read the guidelines for submission carefully before beginning your proposal. Let’s share this out widely — remember that people do not need to be members of the Association to make a proposal (although they will need to join if their proposal is accepted). The call for papers has just been issued for THEOCOM 19, which is an annual symposium-style gathering of theologians and other scholars around the topics of digital culture and communication. This summer, July 21-23, it will focus on how faith formation is shaped by digital culture. Deadline for proposals is March 30th. Bert Roebben, past-president and program chair of the REA, is pleased to announce a new degree in ecumenical studies that his university — Universität Bonn — is offering. We rejoice with him in this new learning opportunity! A reminder that a response to the call for papers for the upcoming ARC (theopoetics) conference is due January 7th. Use the menus above (next to our logo) and the footer below to navigate through the site. Please let us know if you need something that can’t be found on this site. Thanks for visiting!